THIS ILLUSION IS 100% SAFE AND NOBODY CAN BE HARMED. IT IS JUST AN ILLUSION, BUT ONE OF THE MOST CONVINCING YOU WILL EVER SEE. This has proven to be the most controversial release that Devin Knight has ever released. Granted, it is not for everyone, but under the right conditions, this can be the most emotional effect you can perform. Devin used this for two years in his mid-90s tour of his illusion show. The effect was the most talked about thing in his show. Apparently, an assistant is killed by accident in full view (not behind a cover) on stage during an illusion. The illusion is so convincing, that 100% of your audience will think, at least for few seconds, that she was fatally wounded. This is an improvement of an old U. F. Grant idea from the 40s. The performer invites someone up and shows him a gun. This could be a rifle or a revolver, not an automatic gun. He shows the person the chamber is empty and even pulls the trigger a few times to show it is a working gun. This is a metal gun, not a plastic toy. The gun could even have a boresight on it, which projects a red laser dot on the target. He shows the person some real bullets (they really are) and has him choose one. No force. This bullet is loaded into the gun in full view of the audience. The performer says he will do some fancy shooting. Using only one bullet, he will shoot a hole in a playing card and pop a balloon. A girl assistant walks out carrying a playing card and an inflated balloon. Performer says he will pierce the playing card and pop the balloon at the same time with only one bullet! The audience wonders just how he will do this. It just doesn't seem possible. The girl puts the hand holding the balloon behind her back and holds the solid playing card in front of her stomach. She stands in front of bale or two of hay, designed to stop a bullet. The performer turns on the boresight and lines up the red dot on the center of the playing card. The audience thinks the performer is fooling around. A real bullet has just been loaded in the gun. They think in a few moments she will move her hand to the side so the performer can shoot the card. Suddenly, with no warning, the performer fires the gun! Was this an accident? Did the performer accidentally pull the trigger? A loud scream is heard from the girl, and a bullet hole visibly appears in the front of the playing card, the balloon behind her pops. 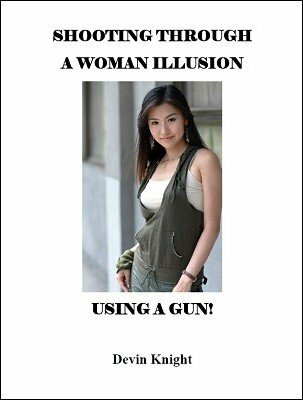 Creating the perfect illusion that the bullet passed through her body! But wait, there is more. She makes a gasp for breath, her eyes close and she collapses on the stage motionless. Everyone in the audience will think something has gone wrong and she has been fatally shot. Audience members will scream, some may even faint. It has happened during some of Devin's performances. The audience is experiencing a terrifying moment. Emotions are running rampart. After a few seconds, the girl opens her eyes and stands up, saying, "I was just kidding." The audience will burst out in laughter as relief from the tension. An immediate round of applause will be forthcoming. The audience will be fooled as to how the bullet went through her body piercing the playing card and popping the balloon, yet she is still alive. It is a double mystery they will never forget. With proper showmanship, this can be the most dramatic effect you have ever performed. This is the first time Devin has revealed this secret. There are no sleights used. Foolproof. Note: You can perform this as a straight illusion with the magical penetration with no one apparently being shot. Due to the clever secret and method, no background check is needed to perform this. 1st edition 2017, 15 pages.